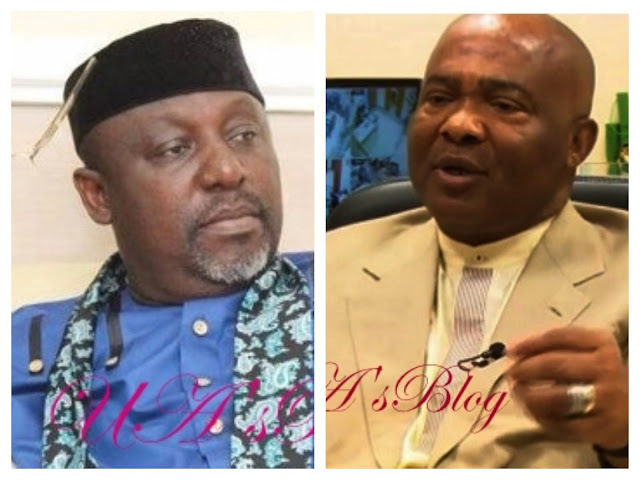 Governor Rochas Okorocha of Imo state has said that the All Progressives Congress (APC) governorship candidate in the 2019 general election, Senator Hope Uzodinma, is hell bent on becoming a governor because of the immunity it would confer on him against prosecution. The governor also denied insinuations that he was behind Uzodinma’s travails, saying that the incidents for which Uzodinma was being investigated predated his (Okorocha’s) ascendancy as governor of Imo State. He said that in saner climes, Uzodinma should have resigned his position in the senate, instead of seeking to be governor. Okorocha, in a statement signed by his Chief Press Secretary, Sam Onwuemeodo, said, “Chief Hope Uzodinma who is doing all he could to become governor of Imo State in 2019 and who the National Chairman of All Progressives Congress, APC, Comrade Adams Oshiomhole has thrown up as the governorship candidate of the Party in Imo does not want to become governor to actually govern the State but to enjoy immunity to enable him escape from the criminal trials he is facing at the moment.